Many of the modern „martial“ arts got „westernized“ and changed to fighting sports by giving them a very strict set of rules to be able to do competitions. Kokodo Ju Jutsu honors through his etiquette and values the traditions and principles of the ancient Samurai warriors, because the over centuries inherited forms and ideas braught this very effective martial art. In Kokodo Ju Jutsu we look after a correct form and etiquette from entering the dojo, during the training to the moment of leaving the Dojo. Additional to the martial arts the Samurai also did the „beeautiful arts“, like the tea ceremony (Cha do), flower arrangements (Ikebana or Kado) or also calligraphy (Sho do) because the codex ordered a balance between sensitivity and military abilities, between Bun(culture) and Bu (war). These arts still exist and there is also different Ryus and styles and it is these traditions where the modern way of graduating in Kyu and Dan has it’s origin. For the Samurai warriors these arts where inseparable connected to the martial arts. This is a tradition close to Zen Buddhism where one or more guests come together and get served some Tee and small dishes. which are provided by a rank or a social level behind, so to say in front of the door, and meet the guest keeper in a ducked position and so equal to his level. The ceremony follows an exact ritual from sorting the tools and the dishes to boiling the water,making the tea and serving it. The exactness and accuracy was the most important aspect for the Samurai knights, because the same exactness and accuracy where necessary for learning the fighting arts. There is a legend of a famous master of cha do that was challenged by a swords master to a duel. The tea master never fought with a blade before, so he seeked teachings but the swordsman he chose for that refused to teach him and explained him that a real swordmaster would not just follow strict movement patterns but would lead his sword just on the base of his inner feelings not thinking on his weapon. Just like the tea master would not think on the tea when doing a cha do ceremony but get one with his environment and just doing his task. 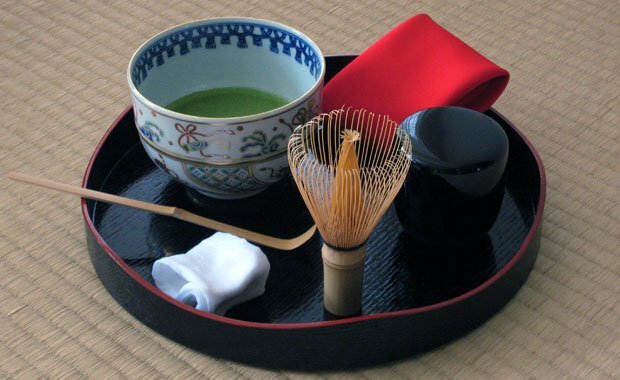 On the day of the duel the tea master asked for the chance to make his tea ceremony one more time which he was granted. He did this with his usual diligence and inner peace never loosing his focus. His opponent was both astonished and frightened in seeing the exactness and concentration, he saw his error and did not anymore insist on the sword duel. The teaching given in an ancient scroll: „The stroke is executed by cutting back, then down followed by a swift, slight rise to the right like the movement of striking with a whip“, in another one: „a flower scattering, falling without sound on moss, a flower scattering to be heard through the depths of mountains“ . So easy one may think to distinguish which description leads to the martial, and which to the beautiful art, so sure you might be wrong, the first sentence describes the art of calligraphy (writing), the second one on the other hand describes the high art of sword fighting. Ken fude ittai , „Sword and brush ar one entity“ is a teaching of the Samurai, then just like the swordsman strikes from his center and the efficiacy of his blow is assured by a proper attention to his own respiration, also the calligraphist has to be concentrated and throw himself completly into the execution of the Kanji (Sign),because onc the brush touched the paper, the ink cannot be retrieved, he has a chance to create with his brush on a sheet of paper which is a life before him with a single chance to belived. The Kanji is a pictographic style of writing based upon squares with eight basic lines from which all signs could be written. The drawn signs have their meaning sometimes alone, in certain combinations or number. Some tell little stories like the pictogram of „mouth“ added to the one for „ten“ create „old in the meaning of „the spoken wisdom of ten generations“. Some of these stories stay a mystery for instance why the pictograph with a bird on a nest means „west“. RYU „The Tradition“ The origin of the ryu, martial arts styles, was in the 14th century as warrior clans began to organize their professional skills in passing the most effective on to others. But the meaning of the word and the Kanji is also the flow of water and so the flow of traditions and arts. DAN „the rank of advanced practice“ is a goal to every Budoka, a grading at a Dan level(in many martial arts a black belt).It is the Kanji that describes it best „to carve steps up a cliff“, to move on his way up to recognize once on top that the landscape expands from here and gives way to another broad view ready to explore. In terms of the martial art it means to see that this level does not mean perfection but just a simple introduction to the teachings. JUTSU „the art“, issuffixed to all kinds of words to indicate an art form, Bu Jutsu for instance is usually reserved for martial arts. The kanji is written with the radical element for road combined with a character that means twisting and simultaniously adhering.It implies a lond and twisting road one to which the adherent must do excat that: adhere, to master with admission the way of the warrior. This art started around the sixth century of our time, and also has it’s roots in the buddhist or shintoistic tradition to place some bowls with offerings as gifts on the altar of the Buddha or Shinto deities. As a symbol for the beauty of the visible life serve flowers, and they also remind through their short lifespan on the perishability of life. It might be this reminder on the finity of life why the Samurai had a great admiration for the flower arranging, and sometimes had high ranked Ikebana masters in their castles. Also the tradition to honor the school’s founder inside the dojo and make some kind of shrine for him (Kamiza) had the need of having flowers similar to altars. This task was often forwarded from the msterto the highest ranked pupil in the dojo, and so some advance and dilligence in Ikebana where needed to achieve higher ranks in the martial art. An episode of the collision between old traditions and modern understanding for „martial arts“ is being told in Dave Lowry’s book“Moving towards stillness“ as an American Karate teacher began to roll out in front his Okinawan colleague what grades and promotions he already has, and that his teacher is about to transfer the school to him. 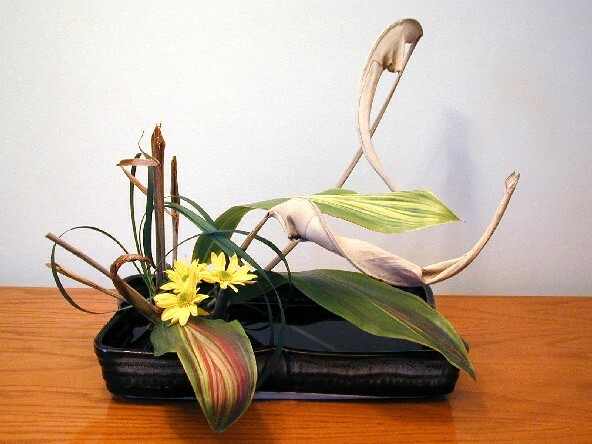 The japanese teacher asked „Oh really, great, what tradition which school of Ikebana do you follow?“ The American didn’t understand a word „Huh? Ikebana, I’m doing Karate!“ To him a tough guy sports like Karate has nothing to do with the soft philosophical flower arranging whereas for the japanese Sensei these two things were inseparable connected to each other because it would be a shame for an Ushi deshi (a master pupil that lives in the house of the master) and also a disrespect to his teacher and to the dojo if he could not arrange the Kamiza properly.